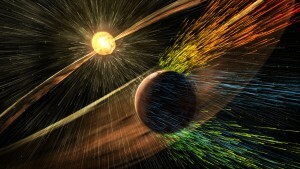 Scientists involved in NASA’s Mars Atmosphere and Volatile Evolution (MAVEN) mission, which is being led by the LASP team at the University of Colorado Boulder, have identified the process that appears to have played a key role in the transition of the Martian climate from an early, warm and wet environment that might have supported surface life to the cold, arid planet Mars is today. There are roughly 30 LASP scientists, graduate students and undergraduates who are on the science team and analyzing the MAVEN science results. LASP provided two science instruments and leads science operations as well as education and public outreach for the mission. LASP’s Nick Schneider, Frank Eparvier, and Robert Ergun all head up instrument teams on NASA’s MAVEN project.